Pay attention to the tiny red dots on this yellow cherry leaf, as if it had "cherry pox". Although the signs of pathogen attack and decay are only small, the beauty lies, as it is often the case, in the detail. Over the years, I have looked at many high-resolution leafscans that often reveal details that I hardly ever notice when I just rustle through fallen autumn foliage. Pathogens that cause lesions such as the dark spots on this cherry leaf often alter the tissue around the point of attack. The visual testimony of this host-pathogen interaction is often a distinctly colored halo around lesions. Whatever the cause, you may just enjoy the tiny red spots! Also, have a look at the other images in the leafcolor gallery, all of which are not photographs, but scans. Today's watercolor compositon brings me back to California, more specifically to Yosemite National Park. During our summer holiday of last year, Tuolumne meadows was our first stop after leaving San Francisco. 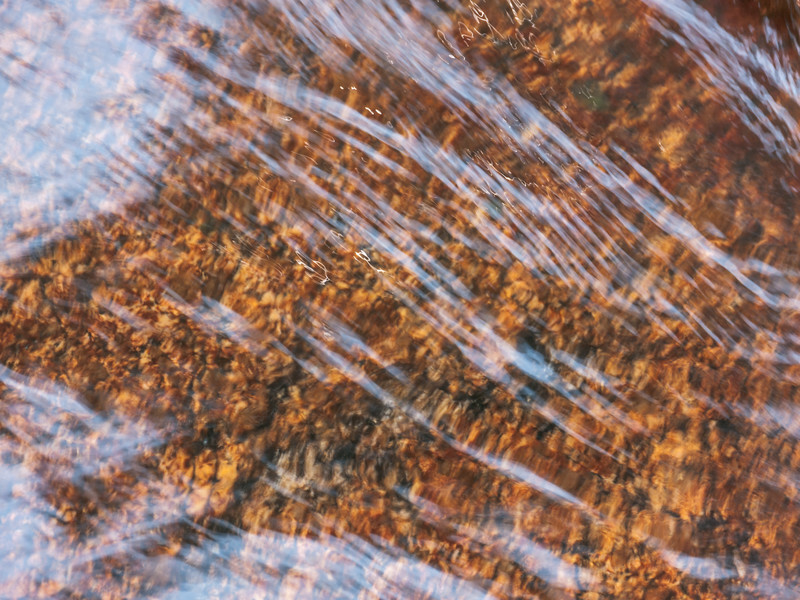 After a morning hike to Lembert Dome, we made a lengthy pause at Tuolumne River, where the children played in the water and I used the time to photograph. 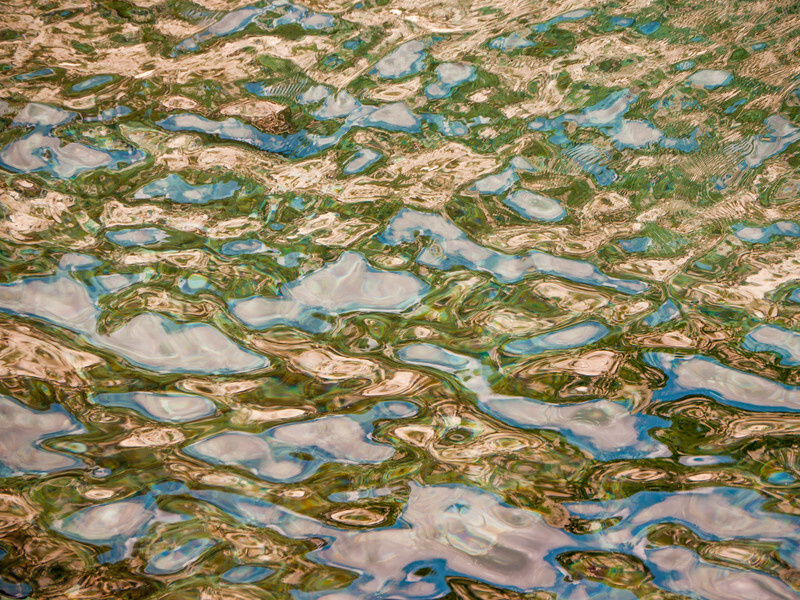 I was particularly intrigued by the watercolor swirls and patterns on the surface of the water gushing around rocks. 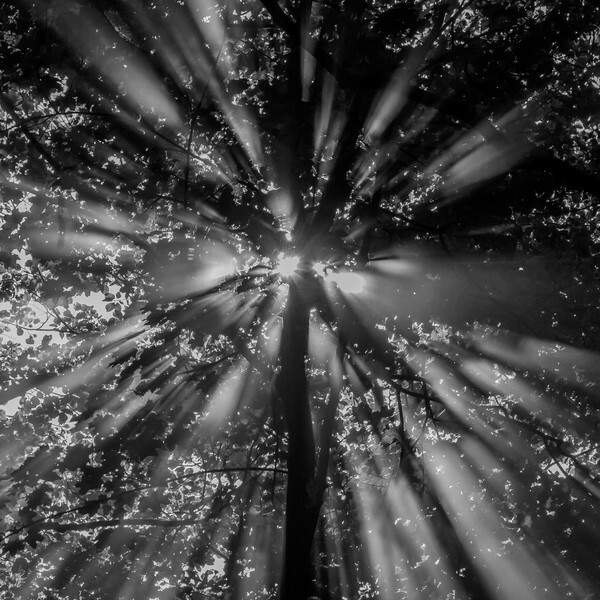 For me, the photograph above captures the essence of that impression and I hope some of you like it. If you want, have a look at the watercolor photographs shown in earlier blog posts or at the watercolor gallery. The building called Forum Chriesbach that has been shown in several nearby photographs already. In this example, the lens was shifted upwards for perspective control. The photograph belongs to the reflections gallery: Almost the entire right half is the mirror image of the left half. The reflective surface belonged to only one of the building's glass panes that was just a few centimeters from the lens away, and yet, focus was on infinity. I have a new, mirrorless, interchangeable lens, tilt-shift (MILTS) camera. My MILTS camera allows any lens with a Canon EF mount to be shifted by 15 mm and tilted by 10° in any direction (tilt and shift movements are perpendicular to each other). In my case, the camera's specifications are identical to a Sony A7r, but it could just as well be any Sony E mount camera; thanks to the Canon EF - Sony E mount tilt-shift adapter from Mirex (it is not advertised on their website - you have to contact the company by e-mail). The Sony E mount tilt-shift adapter's specifications are virtually identical to the version for micro four thirds (M4/3) cameras. The tripod mount is interchangeable between the two adapters and the tilt-shift mechanisms are the same; only the lever to rotate the adapter is differently designed. I find it more convenient on the Sony model. First, I had planned to use my micro four thirds tilt-shift adapter with a cheap M4/3 - Sony E mount adapter, but unfortunately the two adapters that I have tried were not fitting properly. Albeit not fitting well at all, the set-up allowed to test my manual lenses and their tilt-shift capabilities on a full frame body. To my surprise, all the nice, old lenses that I am using allow both, tilt and shift movements, although not the full amount. As expected, the corners of the frame get black when the lens is shifted maximally. The exact degree of tilt and shift (without vignetting) is specific for each lens (due to different image circles) and also depends on the sensor size of the camera (it would be much less of an issue with a smaller sensor). All in all, I am just as satisfied with the Sony version of the tilt-shift adapter as with my micro four thirds model. If at all, handling is even easier on the Sony body, because it is slightly larger than my Lumix GH1 and because of focus peeking: It is quite cool to see colors indicating the areas in focus move across the frame as you tilt the lens. The adapter is, in my opinion, extremely well built and has quickly become an integral component of my Sony A7r body. Since I am using almost exclusively old manual lenses (Leica R, Olympus Zuiko, Voigtländer) that are permanently adapted to a Canon EF mount (with a Leitax replacement mount), I hardly ever take the adapter off the camera. If you want to learn more about the Canon EF - Sony E mount tilt-shift adapter, head over to the excellent review at "on landscape" or post a question as a comment to this posting. P.S. I have bought the tilt-shift adapter that is described here as a regular customer from Mirex. I am not associated with Mirex and I do not receive any form of compensation for writing this text. 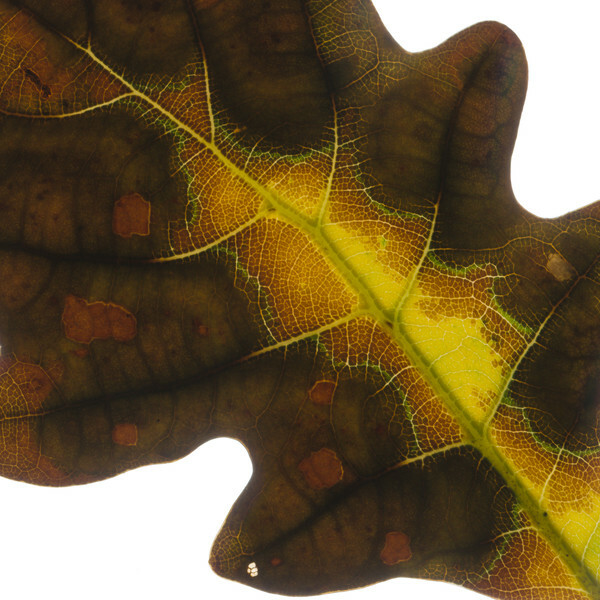 In this detailed view of an autumnal oak leaf, I like the many different tones of brown and the contrasty yellow and greenish leaf veins in the center. The leaf seems to die and dry from the edge and only in the center a small shape remains alive. A thin green line separates the yellowish core from the withered edge. I guess that the leaf has been infected with a fungus and what you can observe is another example of autumnal decaying, as in the last leafcolor example. As all the images shown in the leafcolor gallery, it is not a photograph, but a scan of a fallen leaf. As promised last week, here is a second example of a Calanque d'En Vau watercolor composition. It has been taken from the same spot as the last example, except that it was captured exactly 25 minutes later (thank you EXIF data!). In this photograph, the greenish-turquois color of the water is more apparent and spotted with the white and blue reflections of the sky and clouds. More watercolor compositions have been shown in earlier blog posts and are presented in a dedicated online gallery. A decaying, autumnal maple leaf. Or rather a stickman watching you? Autumn is not only the season of bright colors, but also of decay. It is prime time for fungi and a plethora of other decomposers. The second leafcolor composition. It is not a photograph, but a high resolution scan. My September 2014 print is presented most fittingly, despite it being two days late: Completely by chance I have just discovered that the photograph above was taken exactly three years ago - on October 2nd 2011! We were hiking along the Lägern, when the sunbeams broke through the fog and dissolved the heavy mist. Although I am not particularly fond of black and white photography, sometimes color distracts from the main subject. In this particular composition, the sunbeams became slightly orange towards the periphery and some of the geenish leaves were brightly lit, in my opinion also distracting. Therefore, I prefer this particular photograph to be in black and white (with a lot of greys in between). In the composition above, I like how the eye is drawn towards the bright spots in the center, as well as the circular appearance of the whole frame. To me, it looks a little bit as if the photograph was round. If you want, have a look at the other photographs that I have printed already this year or suggest a photograph to be printed.